My husband loves tabbouleh. Actually, he just loves anything with lemon and herbs in it. I can count with one hand the number of times he's actually made dinner for me and with the exception of one of the meals, his dishes always had the same three ingredients: cilantro, lime, and bell peppers. And the best part is, he didn't even realize that until I pointed it out. So now its my turn to take his three favorite ingredients and whip up something for him. 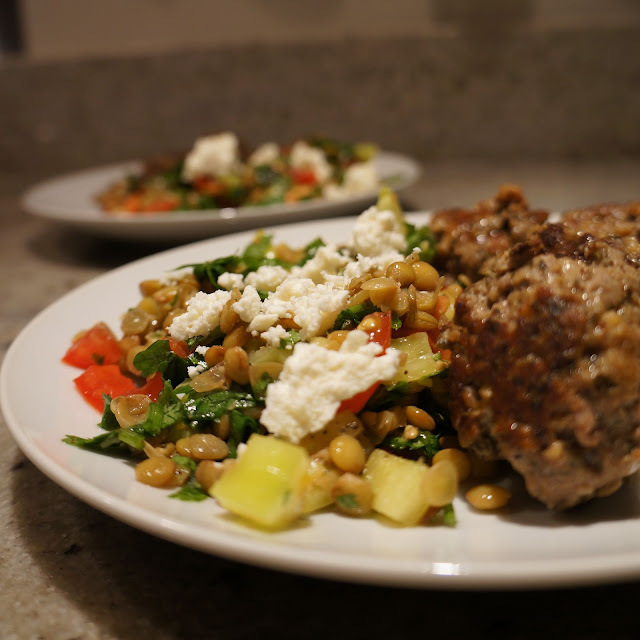 I served this healthy, delicious lentil tabbouleh with some Greek style meatballs. And the bell peppers and basil were from Hampstead Farms. I love locally sourced foods. Combine all the ingredients together except feta. Chill at least 1 hour.